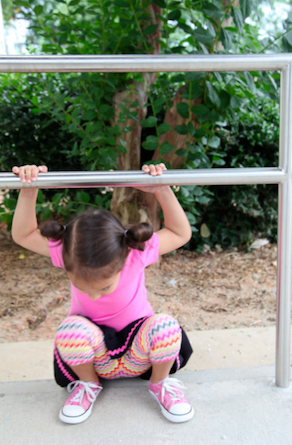 **This post was originally posted on Project Run and Play for Skirting the Issue. Hi everyone! I’m Melissa and I blog at Sew Like My Mom. 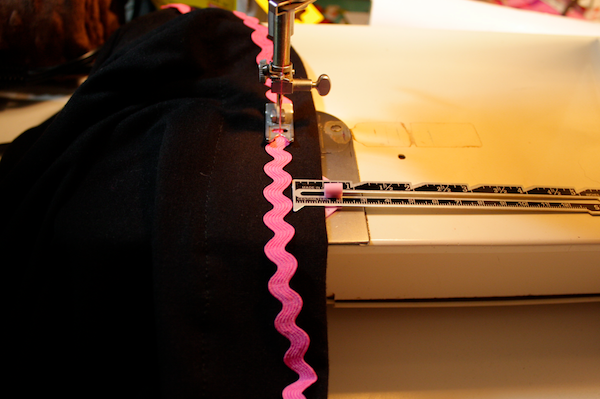 I thought a lot about the kind of skirt I wanted to make for this project. I wanted something modern, comfortable, basic, and easily converted to many sizes. I bounced ideas off my sister, who is also the Mother of 3 girls, and she ultimately suggested I find a way to make bike shorts into a skirt. We both strive to teach our girls about modesty and appropriateness and never let them leave home without something under a skirt. 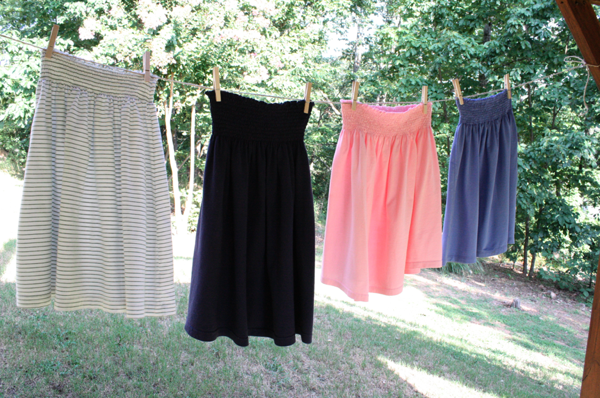 And since I’m admittedly not a laundry connoisseur, often scrounging through piles of clean clothes trying to find any pair of bike shorts, building the bottoms into a skirt was the perfect idea! 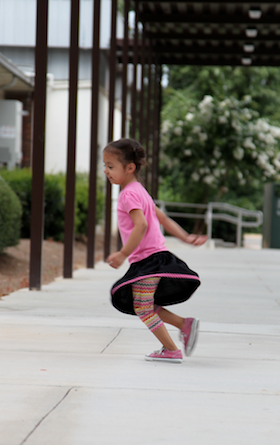 It was really simple to make this basic skirt, and Sofie and I both love the result! I want to sew these for everyone I know! It provides wonderful piece of mind to know my little girl is covered and can play as she likes. And best of all, there’s no searching for shorts last minute, they’re a permanent part of the outfit. I wanted to do something that played with patterns showed contrast, so I used capri length leggings instead of bike shorts, though the technique is the same. I found these leggings on sale at Old Navy (and have decided to start stocking up on them when I find them on clearance!) and got some basic black knit at Hobby Lobby. 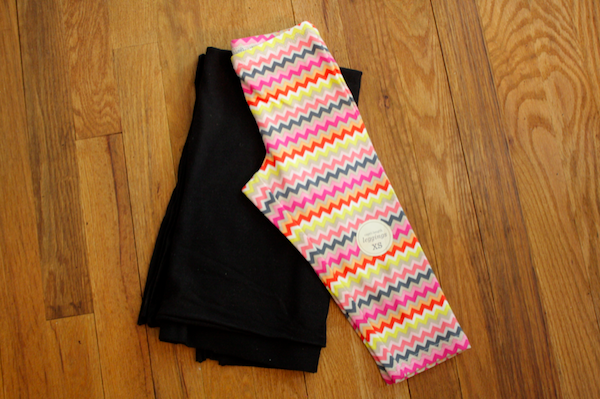 I measured 1/2″ below the bottom of the elastic on the leggings and marked it all the way around. I then carefully cut the waistband off. Leggings typically have a big rise and come up high, so I knew I had enough room to play with for seam allowances and still have the skirt come up high enough. **Another plus to using store bought leggings is never having to guess what size they are. I know that as I’ve sewn for my girls I often forget what size a dress or outfit is when I pull it out for the next person to wear. 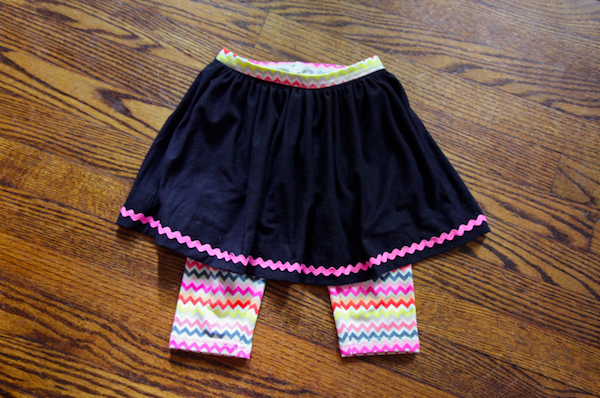 Since I used leggings that I wanted to be seen, I made the skirt shorter than I normally would for Sofie. I cut my fabric 12″ long by the width of the knit, 60″. I put right sides together and sewed a seam down the side to make a tube. Then I ran 2 rows of gathering stitches at the top. 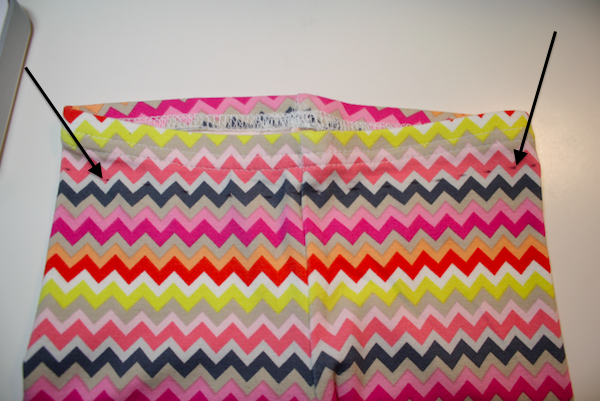 On big projects like this, I put 2 rows on each half so I’m only gathering half the skirt at a time. It’s easier and the thread breaks less often that way! 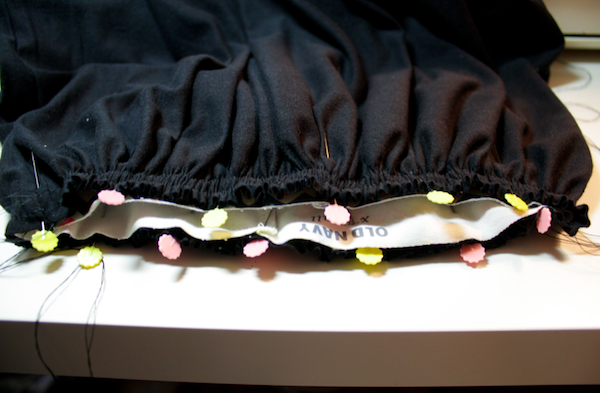 After gathering both sides, I carefully pinned the skirt to the leggings and stitched it in place. I then took my waistband piece and pinned it on and stitched it down using a wide but narrow zigzag to allow for stretch. 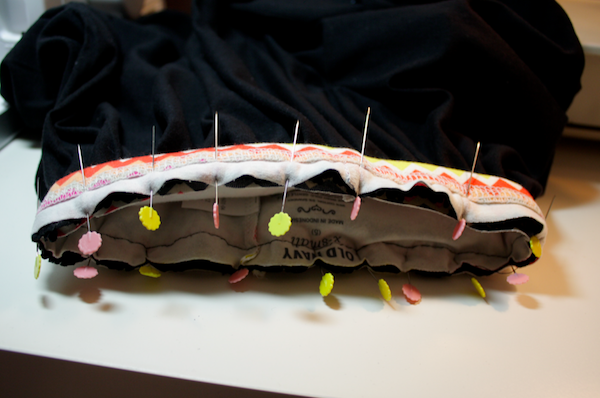 I made this seam run right up against the bottom of the elastic. 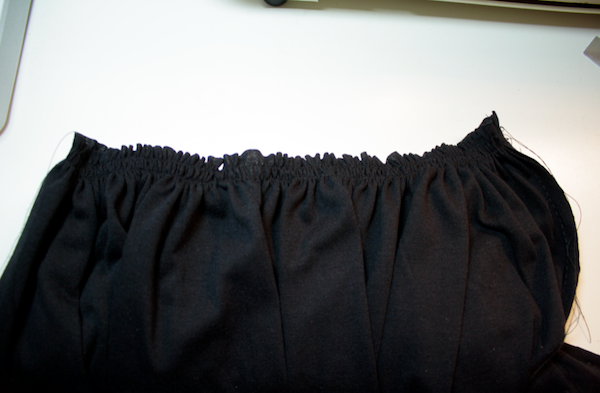 I then trimmed and serged the seam off as short as possible to reduce the bulk in the waist. 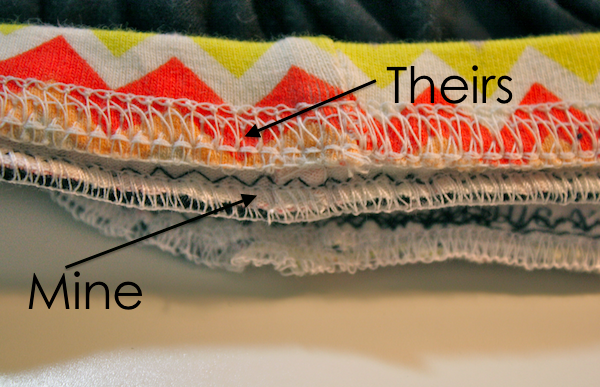 If you don’t have a serger, just do a zigzag and trim. This isn’t to keep things from unraveling, it won’t because it’s knit, but to keep all your layers together and not bulky. 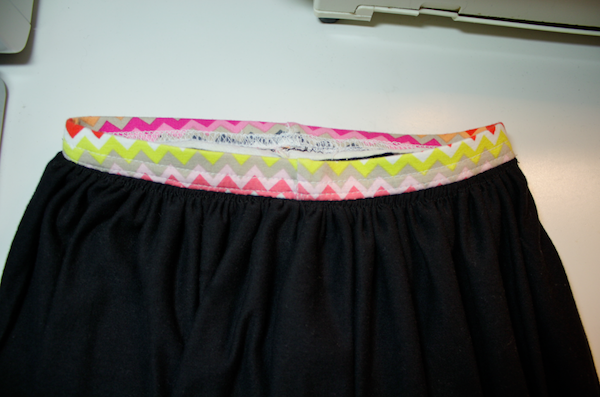 The finished product is a nice, clean waistband with bottoms built in! 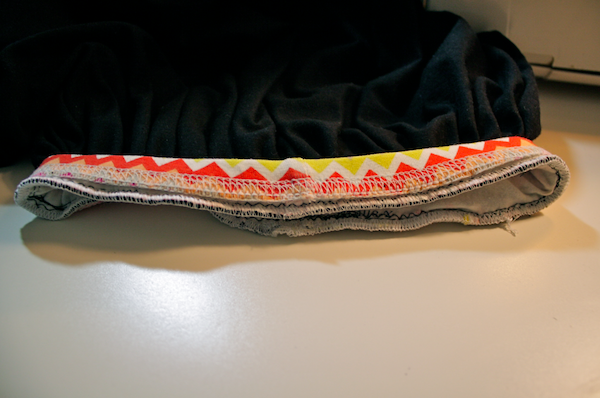 I then folded the bottom of the skirt up 2″ and hemmed it. I decided to add my rick rack for a finishing touch to complete the look. I did it quickly, using a hem gauge marked at 1/2″ and a straight stitch. I can’t wait to make a million more–both for my girls and to donate here locally! 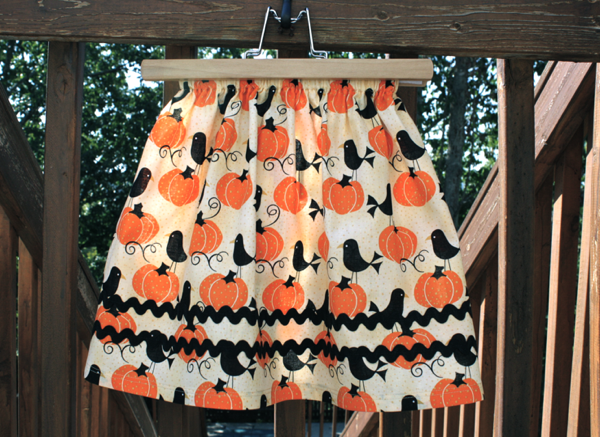 I have several other skirt tutorials on my blog if you’re interested in poking around some! 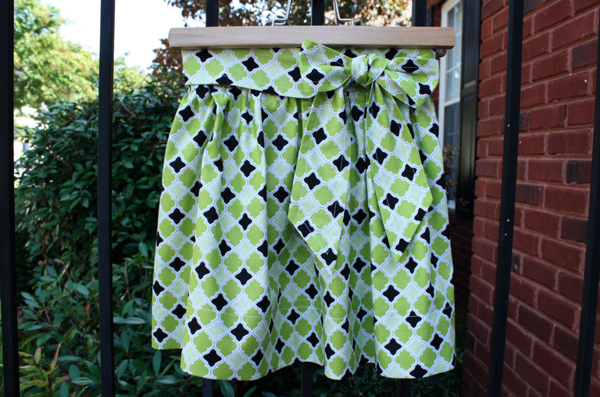 This is a very basic skirt, good for beginners and easy to embellish! 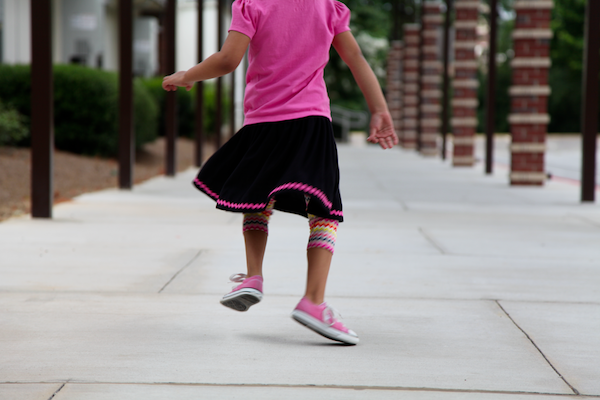 The Toddler Tie Skirt can easily be sized up to fit girls of all ages. And the Shirt Skirt is the best! 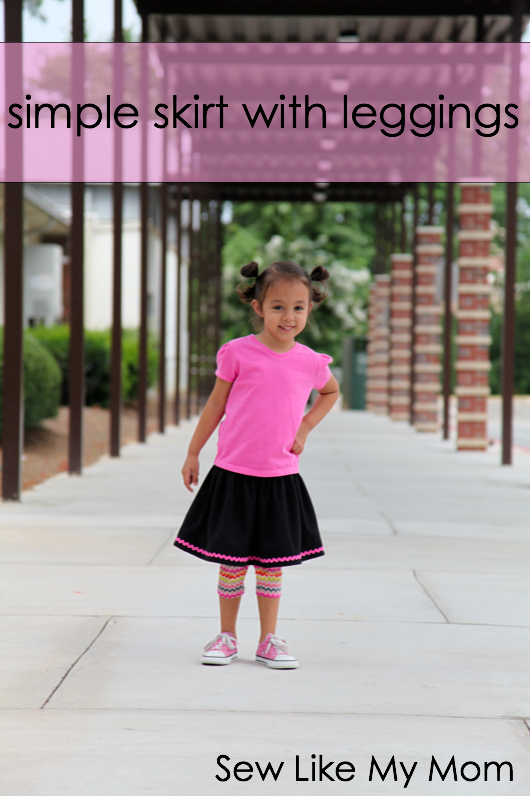 This would fit any age range and is one of the least expensive or time intensive skirts you could ever make! Thank you so much for having me, Liz and Elizabeth! I love your blog, but finding things on your blog is terrible. I saw on pinterest your cute towels with the ribbon and really wanted to make them but when I got to your site, I couldn’t find it because you didn’t really label any of your posts with the actual project, after looking through a couple of months I just gave up trying to find it…. I’m so sorry you feel that way. It seems it’s the mistake of the person who pinned it, though, not me. I searched “cover-up” and it came right up. I hope in the future if you have problems finding something you shoot me an email for help. I’m in the middle of doing a blog makeover and putting in a page with all tutorials is one of the main changes. this is such a great idea, especially the waistband. 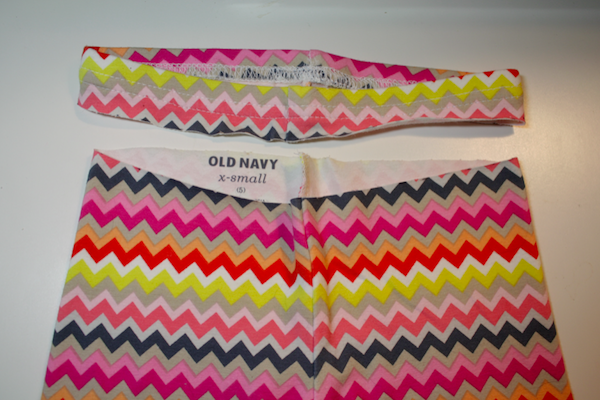 I just made a skort using this tutorial — it is amazing!!! I love it! I called my mom and said, “it worked! !” thank you so much for this tutorial. 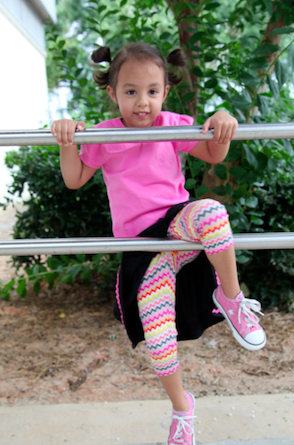 very easy to follow and I can re-use my daughter’s fall leggings as shorts under some summer skirts!! thank you again! Reply to ArticlePlease do not use offensive vocabulary.